The wonderful part of either option is that they are both tasty. Juices are often sweeter because the flavors are more concentrated, while smoothies leave you feeling fuller longer because of their thick and chewy texture, and also because they contain fiber. This is the main difference between the two. 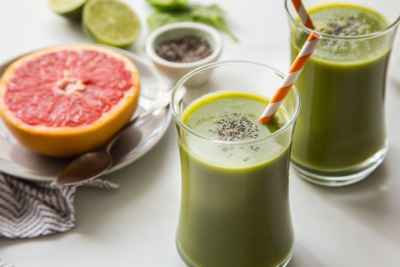 Juicing generally leaves you with a big pile of pulp left behind, which is all of the plant fiber; in a smoothie, this fiber remains, helping to push things along your digestive tract. So if you are solely choosing to juice, you must be sure to get your fiber intake from other foods, such as broccoli, spinach, sprouts, quinoa, chia seeds, and beans. The downside? Juices usually contain a lot of sugar and because they have no fiber, can lead to a spike in blood sugar followed by a crash. This isn’t the case with smoothies, since fiber creates a steady release of sugar which leads to sustainable energy rather than a quick spike and crash. 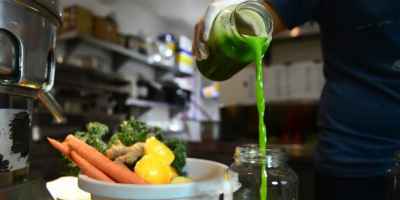 Next articleDrinking Liquids with Meals: Good or Bad?